Apologies if this hits your FL twice; it's showing up in my main journal but doesn't seem to be appearing in everyone else's list, from what I can tell. Anyway, here's a little collaborative work in progress from myself and the illustrious kingsnake. Enjoy! ^_^ Thanks! 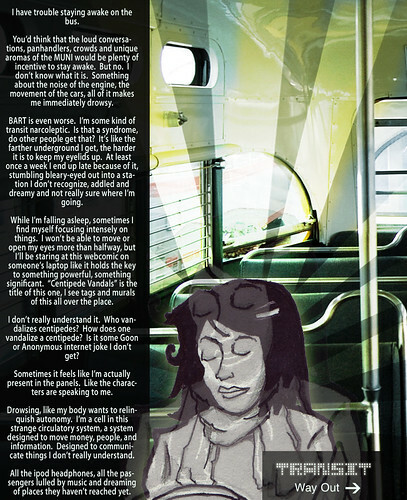 More to come on Transit for sure -- we've got further scripts, arcs plotted, and art in progress. It's still a ways from being polished, but I think Trey hit a point where he was tired of sitting on all our pre-work and wanted to post some stuff, and I was like, "Then post that sucker." I can totally get drowsy on the train -- it's falling asleep at night when I'm SUPPOSED to, that I have frequent problems with.